Lion Brand ‘Thick & Quick’ chenille yarn is on sale for $1.99 starting today until the 31st at JoAnns. I don’t think I have ever seen it for this price. I am wondering if it is being discontinued or if new colors are being released. 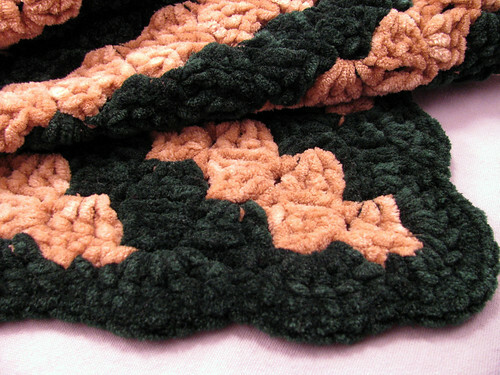 It is not a yarn I use often, but I did make a really warm afghan out of it a while back. All I did was crochet a crazy stitch square and put a shell border around it. I worked stripes, since making a crazy stitch gives it a zig-zag effect. It was a really fast afghan, it can be crocheted in couple of days. I think it took 20 skeins, 10 of each color. I didn’t use a pattern. I increased crazy stitch clusters until I was half way though the tan yarn then I started decreasing. So it is a perfect square, rather than a rectangle. It is so heavy and warm. I am thinking about getting more yarn. This time maybe using more colors. I don’t need another project, but the price of the yarn can’t be beat. Here is a better look at the edging and the color is closer to the real thing. Also the yarn washes well. I use the knit cycle and set the dryer on low heat. 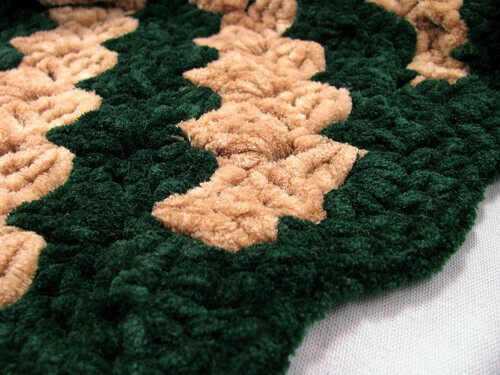 This entry was posted on Sunday, January 11th, 2009 at 3:00 am and is filed under Crochet. Tagged: Afghan, Crochet. You can feed this entry. You can leave a response, or trackback from your own site. Looks rich and warm. My husband LOVES chenille!